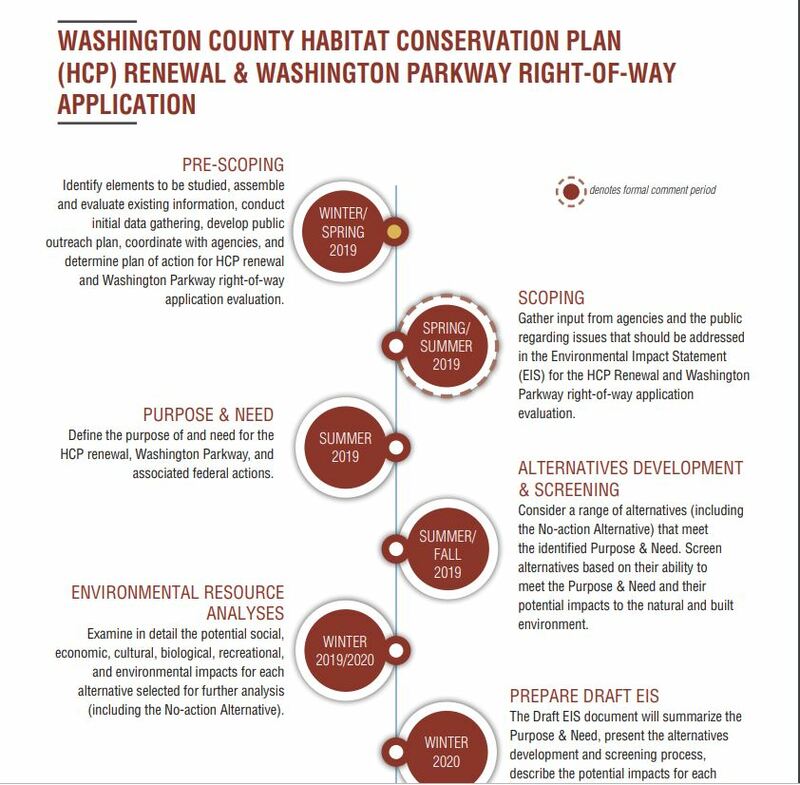 Washington County has hired the environmental consultants SWCA and Jacobs Engineering to carry out the following timeline, and CSU is calling on all the observers, networkers, analyzers and communicators in our community to help us protect the Red Cliffs NCA by participating in NEPA. Please review the job descriptions below the timeline, choose your skill set, and email sarah@conserveswu.org for more info! Do you hit the trails in the Red Cliffs NCA frequently? Is your phone full of pictures of tortoises, lizards, birds, cacti, trees, flowers, petroglyphs and more? CSU needs you! People who spend time in the NCA can use their observations and personal experiences to alert the BLM to the different resources that could be affected by the Northern Corridor Highway during the NEPA process. The places you enjoy hiking or viewing wildlife could be affected by the highway, and your knowledge of these resources will help prove why the NCA needs to remain protected! The Observer’s NEPA Specialties- 1-Providing local data (maps, GPS locations, photos and observations) that can be used to make a specific recommendation during NEPA commenting. 2-Helping to ensure that NEPA documents provide the public with a full picture of resources, resource-uses, and conditions that would be affected by the Northern Corridor Highway. 3-Learning more about your favorite resource(s) by bringing in reputable sources like scientific studies, recent articles and research papers. Do you have a hefty address book, hundreds of Face Book friends, or a jam-packed schedule full of community events? Are you involved in local civic organizations, businesses, clubs, churches, outdoor and/or other groups? CSU needs you! Knowledgeable, active community members can identify stakeholders who need to comment during the NEPA process because their homes, businesses or lifestyles would be affected by the Northern Corridor Highway. Your connections, diplomacy, and ability to rally the troops could help increase the quantity and quality of NEPA comments! The Networker’s NEPA Specialties- 1- Identifying community members who could be impacted by the Northern Corridor Highway and building relationships with them. 2- Engaging and organizing community members to attend town hall meetings and hearings where their concerns can be heard. 3- Keeping different groups on track with a timeline and schedule of events to ensure that all voices are heard. Are you a careful reader, a margin note-taker, or a big-picture thinker? If you’re good at following arguments, identifying gaps in logic or poor conclusions, perhaps someone who argues with the tv from time to time then CSU needs you! People who can analyze NEPA documents, identify inaccurate information or gaps, question methodology, and present additional and relevant information lay the bedrock for crafting substantive NEPA comments. The Analyzer’s NEPA Specialties- 1-Analyzing the range of alternatives to the Northern Corridor provided by the BLM and pointing out the best elements from each one. 2- Red-flagging inadequate science, poor data, or failure to comply with a land management plan, laws, or best management practices. 3- Ensuring that short-term, long-term, direct, indirect, and cumulative impacts of the Northern Corridor Highway are all analyzed. Are you a great writer or editor? Can you express important points clearly and back them up with data? Do you have the gift of gab? CSU needs you! People who can digest, absorb and communicate scientific and technical information in a clear, concise way are NEPA champions. Instead of form letters, they give the BLM substantive comments that are as specific as possible and reference federal laws, agency policies, land management plans and resource values to make a strong case. The Communicator’s NEPA Specialties- 1- Incorporating the data and analysis gathered by the “observers” and the “analyzers” to write great NEPA comments. 2- Referencing applicable laws and resource impacts to make comments as specific and powerful as possible. 3- Reviewing written documents for clarity and content. 3- Chatting with agency staff, stakeholders, and community members to understand things from their point of view before finalizing comments.